What’s that saying…that you can’t see the forest from the trees? and it basically means you don’t realise the problem of the situation you’re in while you’re in it. It’s only when you reflect on it, that you see that you were actually doing the thing that you kept trying not to do. Or something like that. Well, that’s what I’ve been doing. I realised that while I was frantically trying to express my experience of Japanese horror in a culturally relevant and engaging way, I was actually missing a very crucial point. That is, why was I doing it? the answer is Fear. To be exact the fear of being wrong and getting a fail for this subject was my prime motivator. By being caught up in trying to create an authentic auto-ethnographic analysis I think I forgot the point completely, which I think is for me to know why I was analysing Japanese horror in the first place, and then to anaylse that. So even though my motives are shallow in that I wasn’t genuinely originally fascinated with Japanese culture only slightly intrigue by its horror movie success, I have, however, through blogging grown to have a much greater appreciation for Japanese culture, and my fear of failure is not a completely unrelated aim to analyse either, because the fear that I have of getting a fail does actually relate to horror movies, in that they are both centered around fear. So do I go down the deep dark rabbit hole that seeks to find out what aspects of fear are most relevant to my immediate society? well, I think that would take a very long time, but I will peek inside it and look around. 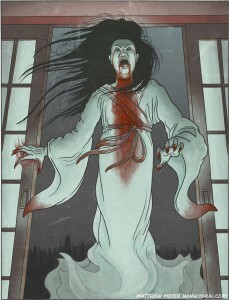 So now I am looking at fear more closely, I want to know what is it in Japanese horror films that I classify as scary? what is it that other people see in them that they think is scary? Fear can touch just about every aspect of our lives, how then are Japanese directors specifically so good at conveying it? What are they doing that makes me actually fear for my safety after viewing a movie? There is a lot involved in these questions and there is no way I will really discover what fear is, though I know it is multi layered and slightly different for everyone. 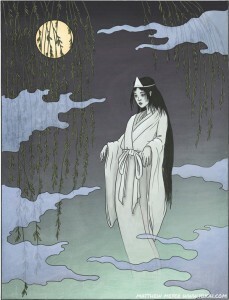 However, with the help of my tweets that I record while viewing Japanese horror, I should be able to get more or an idea of what stimulates my fears and perhaps this will explains other peoples and then perhaps allude to the reasons why Japanese horror resonates with so many. I also am vowing to take more care in my next film choice, and hopefully discover one that will frighten me. Then again fear is relative so there is a chance that even if I get several confirmations that the film is scary I could still be left unfazed, it will be interesting anyway seeing what is determined with increased research. The reason for this is that the last film I blogged and tweeted about I didn’t really have any idea whether it was scary or not (as much as is possible without previously seeing it). I don’t regret watching the last movie I blogged about, the film Kwaidan was beautiful and gave me some important insight into Japanese history. However, I think I should be examining what it is that I actually find culturally engaging in Japanese horror, not just taking direction from an internet top ten list. Even though they are helpful, I think something that I really know is going to be scary would be more appropriate for an auto-enthnographic study, because this is part of the reason why I was intrigued with Japanese culture in the first place, their success in scarying people.